﻿I've worn this garment from Forever 21 a couple of times as a dress, but it makes way more sense as a sleeveless trench. Despite that discovery, I just wasn't feeling this outfit for some reason. There's nothing I hate about it, but I just didn't feel great in it. I'm feeling better about my look today, so I'll plan to post again this evening! I'm sorry you weren't feeling this outfit, but it's really one of my favorites of yours. That Forever 21 piece is just inspired as a sleeveless trench! I definitely like it as well! 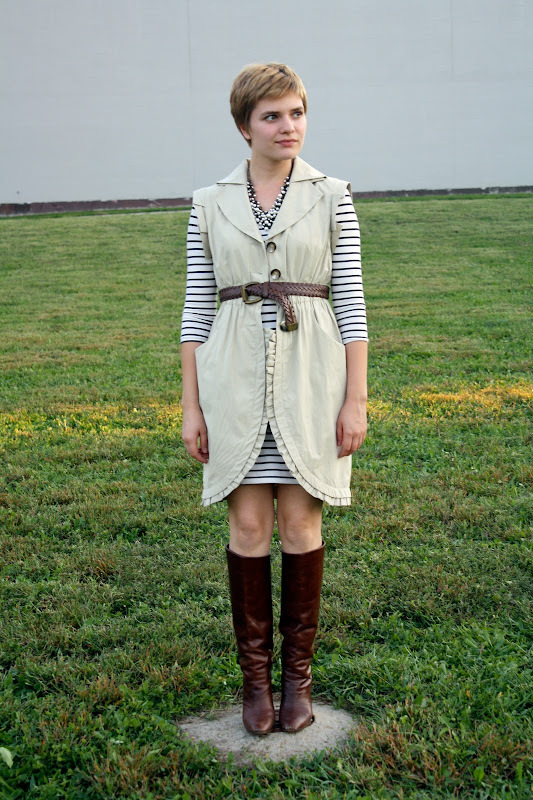 Especially with the stripes underneath and leather boots. I'm glad that you post outfits you aren't thrilled with too. From here, it looks fantastic! really? I actually love this outfit! Sorry you weren't feeling this outfit! I think it's perfectly on trend and awesome! Those boots are perfection. I love how you styled the simple striped dress like this! it makes the outfit more interesting, love it! Don't you hate when you don't love an outfit, but you can't figure out why? It is so frustrating! Aw I really like it!! You look great. You know, I visited Lawrence a couple weeks ago. they have some amazing thrift stores but they are a little more expensive than I've used to. great outfit, lovie! The ruffle detail of the vest is super cute. I hate that feeling of not, well, 'feeling' an outfit, even if you like it. Oh well. I really like the combination of the dress and trench dress over it. I love this outfit. It looks so effortlessly chic! I love discovering new ways to wear my clothes in a way other than how it was intended. Even though you aren't feeling it, this outfit looks great on you! I love your outfit!!!!! Though I definitely know what you mean when it comes to that feeling. I had it today with my so so outfit... Though I dore my shirt I'm not feeling the rest. I like the dress peaking out at the bottom. And, i like the idea. I really like this look! Sorry that you weren't feeling it though. It's such a bummer when you go out and realize that you don't like what you're wearing. It's the worst and definitely puts a damper on things. However, I think that striped dress underneath is marvelous! I would love to see you restyle it again sometime. Great leather boots as well. Ha ha yes you can tell from your face that you just aren't feeling this outfit today. Somedays I feel like I'm trying too hard to make an outfit work and decide to start from square one, no shame in that. I love this trench! I think this is a great look! Even though you're not feeling it, I think this is very cute!! I just watched the greatest movie called the Brothers Bloom where the female characters wear a lot of versions of trench coats and what looked fabulous was pairing the lighter coats with dark or pops of bright colors like red. Maybe try something along those lines! I love it! I think it shows individuality and great style! Kudos!